Lunati 10120702LK - Voodoo Hydraulic Flat Tappet Camshaft and Lifter Kit Chevy Small Block 262-400 Lift: .468" /.489"
*Note: 50-State Legal for 1987 & earlier carbureted V-8 Small Block Chevy 262-400 C.A.R.B. E.O. #D-279-3, D-279-5, D-279-6. 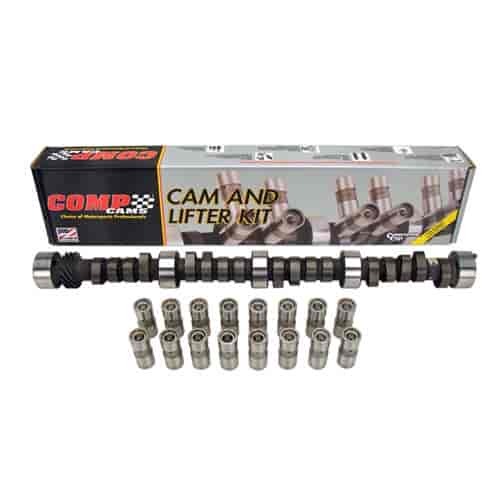 **Note: In order to use these camshafts in 1955-57 265ci blocks, it is necessary to machine a small groove in the rear main journal of the cam to allow oil flow to the top of the engine. Strong torque, excellent mileage for 327-400ci, has smooth idle, likes high axle ratios. Does COMP Cams CL12-205-2 fit your vehicle?